FireKing® - Fireproof Vertical Files Meet UL Impact Requirements and Explosion Hazard Ratings for Safety and Security. FireKing® - Fireproof Vertical Files remain locked and intact without damage to paper contents after enduring 1500°F, a drop from 30'H and heating to 1500°F. Fireproof cabinets are insulated with 100% gypsum reinforced by a 1" x 2" lattice of 14 gauge steel wire welded with aluminum. Each drawer is a separate, insulated compartment to provide maximum protection. Fire proof cabinets are designed to protect contents from sprinklers and fire hoses. Cabinet types are Legal, Letter, and Vertical. Cabinets meets UL 2000°F Explosion Hazard rating and the Class 350 One Hour Fire rating to protect paper contents without damage for 1 hour when subjected to 1700°F. 2" thick walls, Chip and scratch resistant powder coated finish, and full suspension cradle provide additional protection. The high security key lock's drill-proof and pick-resistant features surpass UL standards by 50%. Lifetime Limited Warranty. Free Product Replacement if files are damaged by fire. Colors are black, diamond stone, light gray, putty, and sand. 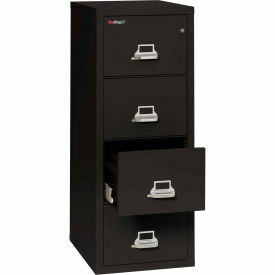 Lateral fireproof file cabinets ensure the safety of your vital documents. 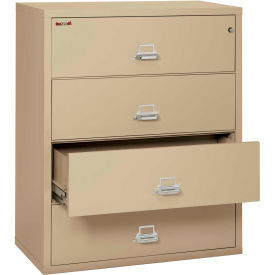 These fire proof file cabinets meet UL impact requirements. Lateral cabinets remain locked and intact without damage to paper contents after enduring 1500°F, a drop from 30'H and heating to 1500°F again. Fireproof lateral file cabinets meet the UL 2000°F Explosion Hazard rating and the Class 350 One Hour Fire rating; protects paper contents without damage for 1 hour when subjected to 1700°F. File cabinets are insulated with 100% gypsum reinforced by a 1" x 2" lattice of 14 gauge steel wire welded with aluminum. The construction maintains each drawer as a separate, insulated compartment for maximum protection. Fire proof file cabinets protect contents from sprinklers and fire hoses. The high security key lock's drill-proof and pick-resistant features surpass UL standards by 50%. Chip and scratch resistant powder coated finish. Lifetime Limited Warranty. Free Product Replacement if files are ever damaged by fire. Interior dimensions: 16-3/4"D x 10-1/4"H I.D. 37-1/4"W File Cabinets measure 31-3/4"W I.D. 44-1/4"W File Cabinets measure 38-3/4"W I.D.